Illegal disposal or "midnight dumping" is whenever trash is disposed of anywhere other than a permitted landfill or waste facility. Believe it or not, a good portion of the public does not know what illegal dumping is or that it is illegal in the first place. Most often people will illegally dump their waste or garbage to avoid collection and disposal fees, or because “it is too much of a hassle” to properly dispose of their garbage at a designated dump site. When people illegally dump their garbage on your property the burden and cost of cleaning up is now passed on to you. There are several ways to avoid unwanted waste and unnecessary costs on your facility. Posting No Dumping signs, setting up surveillance cameras, lighting and property maintenance are some of the key aspects of preventing illegal waste from being dumped onto your area. The public is sometimes unaware that tossing garbage or throwing out junk into an area that isn’t a landfill or waste facility is a crime and punishable by fines or prosecution. 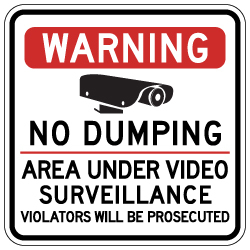 Posting No Dumping Surveillance signs can be an effective way in both preventing criminal offenders from trashing your land, and bringing awareness of ordinances to other neighboring properties. Most often when pedestrians or other would be offenders see signage posted stating that violators will be prosecuted for trashing the area, they will immediately vacate the premises and move on. Displaying these types of messages around your property is a great way to promote security and ensure that people are following lawful and safe practices. If they decide to neglect the signage and continue to dump their waste, they are at that point willingly committing the crime. Police and local authorities will have an easier time prosecuting the lawbreaker(s) when there is noticeable signage posted in the area warning of the illegal activity. You can also rely on the fact that displaying these warnings signs will allow you the ability to take legal action and sue the culprit(s) for cleanup costs and potential damages. Unfortunately you will not always be around to keep an eye on your property to catch would be offenders from throwing out rubbish onto your land. In these cases, having security cameras set up is a great way to capture evidence of the committed crime. It’s inevitable that sometimes the perpetrator who’s caught would deny any allegations in regards to the junk he or she has dumped onto your land. With the video evidence & captured images caught by your security cameras, the culprit who dumped their trash onto your land can’t deny what they have done. The law will always be on your side when you use Security Surveillance Systems in combination with posting No Dumping Warning Displays. When you look at a site that is pristine and carefully maintained, subconsciously you are persuaded to help maintain that sense of cleanliness. It is rare that you see these types of areas littered in waste and junk. It is important that you maintain the “look” of your property so that it does not attract illegal dumping. Some simple ways of maintaining your land can range from lawn care and trimming, planting decorative trees and bushes, and/or making sure there are no graffiti markings on the walls of your buildings. Keeping the area cleaned up is a good idea. If waste is allowed to pile up, then people are more likely to feel comfortable illegally dumping their trash there and the spot becomes a de facto landfill. Good property managers know that maintaining their properties in an attractive manner sends a message that illegal disposal of waste is not an acceptable practice in that neighborhood.